Leveraging its expertise and availability of germplasms that have profoundly featured in wheat growing in Italy over the last twenty years, SIS has dedicated considerable resources to maintaining and developing a tradition that involves leading breeders in the sector. SIS's selection and testing work focuses above all on identifying genotypes that can provide stable, high yields. For this purpose, evaluated materials are assayed as part of testing covering different growing areas, in order to evaluate tolerance to multiple biotic and abiotic stress characterising typical cereal cultivation areas in Italy. SIS has also renewed its focus on implementing adequate quality standards for new breeds, that can meet the technological requirements of durum wheat grain processing. This cereal is a fundamental raw material for the processing industry, which has a leadership position worldwide, producing and exporting one of the typical products of the Italian diet: durum wheat pasta. Today the durum wheat grain processing industry,as well as consumers, are interested not only in the quality of wheat but also inthe origin of raw materials.Products of Italian origin are in great demand as industry and consumers want to besure about their trace ability made possible by the verystrict controls carried out during cultivation and the preservation stages.To this purpose S.I.S. has established a wide sreadnetwork of trials, managed directly by S.I.S. from sowing to harvest. This has allowed to evaluate germplasm from different sources to assessits tolerance to multiplebiotic and abiotic stresses. S.I.S.’s own laboratory equipped with the most advanced technologies to determine the technological characters of tested materials, a phytotronand a modern green houseof 250 sq.m. are keys to accelerate breeding times of new varieties and to S.I.S.’s success. October/November Ears on harvesting 500 Inter-row 15-18 cm – depth 2-3 cm Seeds per hectare: 450 seeds/m2 Fertilising: with nitrogen (N kg/ha): 50-80 on heading plus 70-90 at the start of phosphorous germination (P2O5 kg/ha 70 in soil with a low potassium content (K2O kg/ha): 60 in soil with a low mineral content Weeds control: weeds control depends on the type of weeds, with pre-emergence treatments in the case of mainly graminaceous weeds and post-emergence treatment in the case of oat or mainly dicotyledons. Control against fungal diseases: use of industrially dressed seeds, measures against oidium septoria fusarium and rust in relation to specific variety resistances. Standard mass per storage volume, Proteins, SDS sedimentation test, Hagberg falling number - see information on soft wheat. Ash is measured on the entire kernel and expressed as a % of dry matter. The previously milled 4 g sample is incinerated in a muffle kiln at a temperature of 575 °C on a platinum or ceramic capsule until it turns white. Dry gluten. - This is determined on the semolina obtained from a laboratory mill and a special purifier, with specific automatic machines. Results are expressed as a % of dry matter. A quality rating of 1 to 10 is given, based on an evaluation of the plastic and mechanical characteristics of the gluten (strength, stretchability, elasticity, stickiness), and on whether gluten mesh is present. Based on these characteristics, gluten is classed as excellent for pasta making, if it is given a rating of 9 to 10 (strong and elastic); good values range from 7 to 8 (stretchy and elastic), 6 is an average value (not very stretchy), while values from 1 to 5 (stringy and sticky) are poor. This is determined by mechanical extraction in particular conditions, starting from moist gluten and subsequently determining the gluten index to define its strength. The total weight of gluten is defined as the amount of gluten. The percentage of gluten which remains in the rack after centrifugation is defined as the gluten index. If gluten is very weak, it may pass through the rack and in this case the gluten index is 0. If instead no gluten passes through the rack, the index is 100. 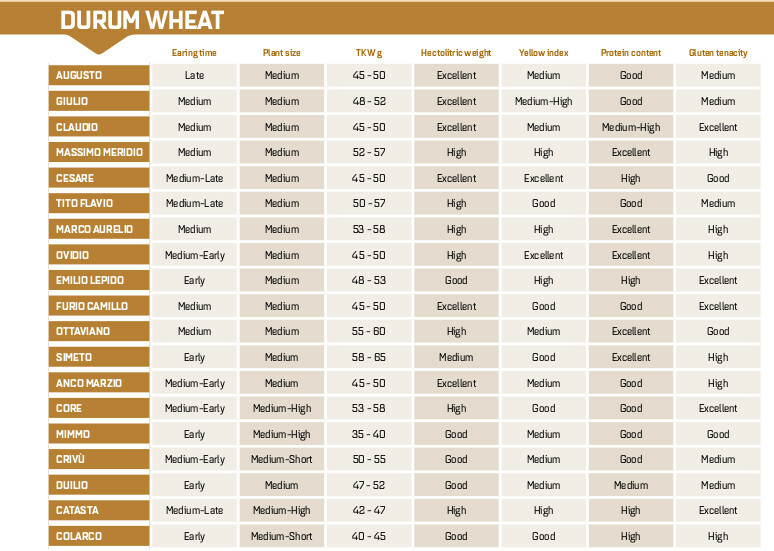 Gluten quality is classified as follows: weak (0-25); sufficient (26-45); average (46-65); good (66-85); excellent (>85). this is determined from the semolina obtained from a laboratory mill and a special purifier. Yellow index values for semolina are normal if 20-21. Special grain semolinas with a high yellow index have far higher values, close to or above 30.